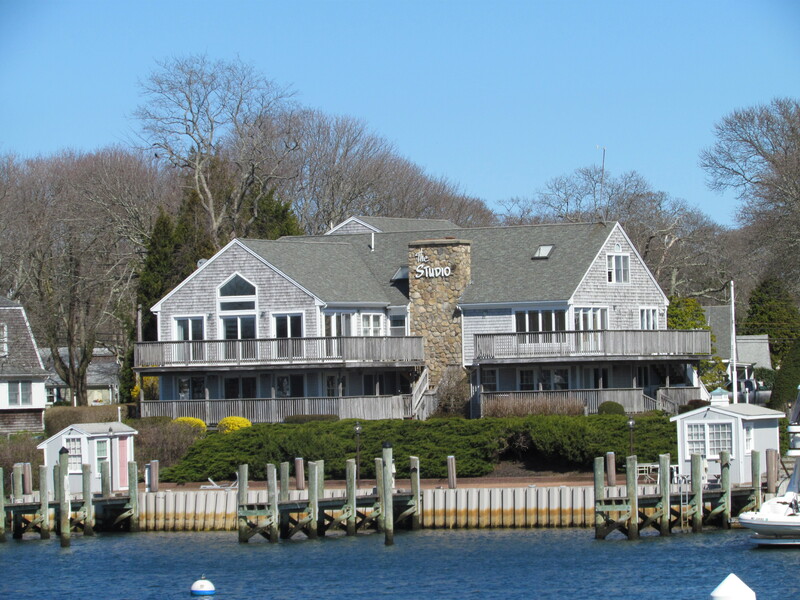 Here on Cape Cod, life is moving along and getting back to normal. Jed is home, no one is sick (although Heather feels like she is getting another cold), and everyone went to work, school, or daycare today. Oma was home alone. The most exciting thing that happened to me today was that my phone fell out of my pocket and tried to flush itself down the toilet. I braved the plunge and saved it—not because I love the phone but because I didn’t want to clog up the septic system. After drying the phone, it was doing erratic things and finally went blank and started buzzing. I took out the battery and let things dry out and tonight the phone seems to be working. I’ve taken it apart again to let it dry more overnight and then I think I’ll be back in business. Heather and Jed’s neighbors, Melissa and Brian Keefe, have two children—Mollie is four and Joey is three. The Goldstones and the Keefe’s have adjoining backyards and the children play together all the time. 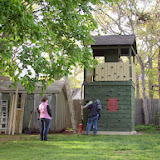 Brian has been working for days putting together a new two-story playhouse he brought from a friend in Maine. I mean this is a SERIOUS playhouse. This evening the Goldstone boys were invited over to play and they loved climbing to the second floor of the playhouse and waving down to us. I see many years of fun ahead. I talked to Mark around 6 pm and he reiterated everything he says in the log. I’m really hoping the ride settles down. I really hate to see Lynda have her first ocean passage be a rough one. But Mother Nature has a mind of her own and when it comes to weather, you get what you get and you do the best you can with it. In any case, I hope to see them coming through the Eel Pond bridge late on Wednesday. I miss Windbird so much, and miss Mark even more. If I have my way, Windbird won’t be sailing without me again. Happy Mother’s Day to any mothers reading this log. And a special Happy Mother’s Day to my daughter and daughter-in-law, Heather and Jo respectively. They spend their lives nurturing their children, my five beautiful grandchildren, and I know that is no easy job. I was with Heather today and although I didn’t talk to Jo, I did talk to Justin and to Ziggy. They sent a beautiful and yummy edible fruit arrangement. Thank you, thank you. I didn’t get to see or talk to Coco as she was asleep when I was talking to Justin and Ziggy, but maybe we can do a Skype call later in the week when Granddad gets here. Heather, Jed, and I had a relaxed day, full of fun with Sam, Jonah, and Oliver. Jed fixed breakfast and dinner and both were delicious. So thank you, Jed. And Heather promises that we are going on a shopping spree together to treat ourselves. Neither of us is very good at taking time to shop for the things we need, so we’ll have to make sure we do it this time. At one point in the afternoon while Jed was putting Jonah down for a nap, Heather was putting Oliver down for a nap, and Sam was resting on the living room sofa, I snuck into the basement to do some cleaning where the old washing machine has been sitting. A new one will arrive this week, so I wanted to get this cleaning done. After a bit, I heard little footsteps coming downstairs. It was Sam and he wanted to know what he could do to help me. He said he hated to see me working so hard all by myself. He certainly knows how to melt a grandmother’s heart. And after I talked to Justin, I had a great conversation with Ziggy. That was another treat. 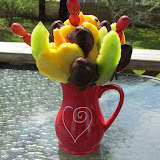 I enjoyed sharing my edible fruit arrangement with Jonah—he LOVES fruit, especially chocolate covered strawberries. And Jolly Ollie entertained us throughout the day. He was wearing the overalls I embroidered for him for his first birthday and he looked so cute. 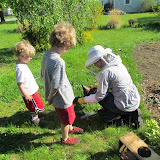 Late in the afternoon, I took photos while Heather checked out her beehive. I so enjoyed seeing the queen and getting photos of the busy bees while watching Heather at work. She has become quite the bee expert. So it was a wonderful Mother’s Day for me. I talked to Mark a couple of times today. It looks like Windbird will leave Chesapeake City in the C & D Canal early tomorrow morning and head out to sea late in the afternoon headed for Woods Hole. If all goes well, Mark and crew will arrive late on Wednesday. They are hoping for fair winds and calm seas, and other than the fact that the wind will have a northerly component, the forecast looks good at this point. To Mark, Lynda, and Lee—Smooth Sailing! Bring yourselves and my beloved Windbird home to me safely. 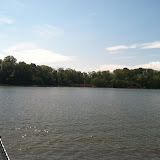 “We got an early start to ride the tide up to Chesapeake City. We knew this would be a short run (only 21 miles), so we were in no rush. But we didn’t want to buck a negative current. The sky was clear and the breeze was behind us. We unfurled the Yankee, killed the engine, and sailed up the northern Chesapeake Bay and almost right to the dock at Chesapeake City. It was terrific after so many days of pushing hard and motoring all the way. We had speeds of up to 8 knots with wind and current. Exhilarating! The rest of the day has been spent getting ready for the three day passage to Cape Cod. We put out jack lines, secured everything on deck, checked engine oil, readied the cabin, got safety gear ready, checked the weather and tides, decided on watch schedules, and went for a walk since we won’t have a chance to do much walking for a few days. After dinner Lee treated us to a delicious desert at the restaurant here at the Marina. “Well, what to say. I haven’t kept a log of any kind so I will go by memory. The first two days the wind was high, up to 38 mph, and the rain made buoys and marks hard to see. The wave period of 4 seconds caused us to dive into the face of one wave while coming down the backside of the one we were on. It was a lot like being in a very large kayak in white rapids that lasted 2 days. It might have been upsetting if I hadn’t ww kayaked for years. The waves settled down after the first two days but the rain continued for a total of 6 days. Then we had 3 days of sun or partial sun and not enough wind to really sail although we put the sails up occasionally. We stayed in some pretty anchorages, the first night out where we could see Leeway (the boat we just sold) in her new slip in Carolina Beach, NC. Probably the two most exciting events have been the alternator cable mishap yesterday which smoked up the cabin and seeing the Island Packet that we are thinking of purchasing again. I have faith in Mark’s judgment and ability so I didn’t get too excited about the overheated cable and we were close enough to shore and houses that I could have swam LOL Our captain has been a patient teacher and his wife and usual first mate did lots of advance food prep so that has been relatively easy because of her work. It will be a learning experience to cook while heeling over at sea. As you will read below, there was a bit of excitement on Windbird today, but all is well. 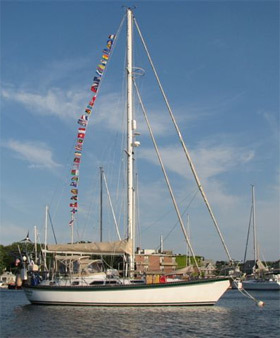 If things go as planned, Windbird could pull into Woods Hole on Wednesday afternoon. So hope with us that the weather doesn’t change for the worse. 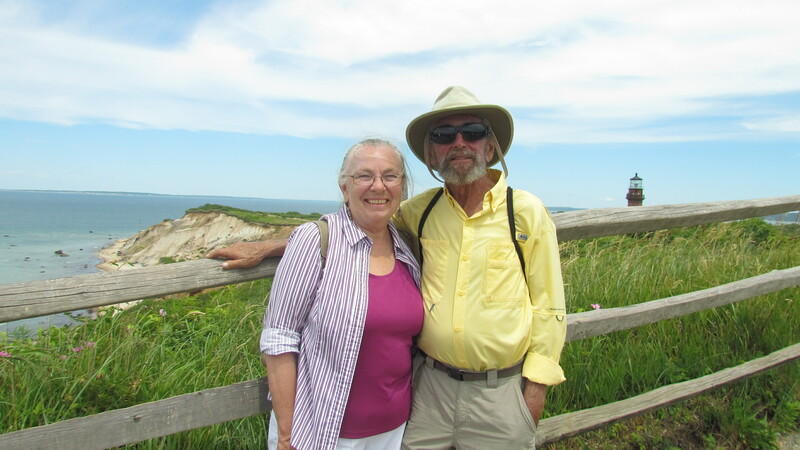 Before you move on to read about the ‘exciting’ day on Windbird, I’ll tell you a bit about our day here on the Cape. I have to back up a bit and explain that yesterday Jonah brought home a stuffed fish named ‘Swimmy’ to spend the weekend. 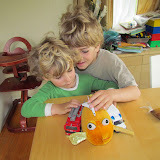 The class of four and five year-olds at Woods Hole Day Care Cooperative is called the Swimmies (versus the Lambies who are younger) and this stuffed fish is the mascot. Each weekend a different child brings Swimmy home and returns on Monday with photos and a story of the weekend activities. So we are including Swimmy in everything we do. Sam also brought home a special thing from his kindergarten class yesterday. They have been watching Painted Lady Butterflies emerge from their chrysalises and there was one that had just emerged at the end of the school day yesterday and one more chrysalis that was yet to hatch. So Sam was deemed the one to bring the butterfly habitat home to care for the butterflies for the weekend. This morning at breakfast, while eating pancakes, Sam noticed that the yet unhatched chrysalis was changing. A butterfly was emerging. What magic! We all watched with amazement. The rest of the day was business as usual. Heather, Jed, and Ollie went to look at new washing machines and I played at home with Sam and Jonah. In the afternoon, Heather and I took Sam and Jonah and went to the Farmer’s Market and to Mahoney’s Garden Center to purchase a few plants. And then we ended the day with a taco dinner. “Some days are more interesting than others. Today we awoke to 15 to 20 knot winds pushing us hard against the bulkhead. I wasn’t sure we were going to get off. But tomorrow is supposed to be worse. As we were contemplating this, another sailboat came in and looked like they were headed for the space behind us on the bulkhead. Lee and I went out to catch their lines. They pulled up parallel to the bulkhead, but about 20 feet off. The wind did the rest. They blew up against the pilings and Lee and I caught their lines and made them fast. Then we helped them put some big fenders between their boat and two of the pilings. We had just reinforced our two fenders with two more as the wind was strong enough to smash the first ones we put up last night. So with both boats safe, we gave some more thought to ways to get off the dock. And then the wind died to 9 to 10 knots. Instantly, we all sprang into action starting the engine and releasing the dock lines. We got away fine and were off to Chesapeake City. But about an hour out, Lynda smelled rubber overheating. I quickly found that the alternator cables were the culprit. The new batteries are larger capacity than we have had and when low (50% of capacity) they consume an enormous amount of amperage. Our alternator is rated for 220 amps but actually probably can only do about 160 amps of output. In the past, our batteries have never called for more than about 110 amps, but these new, higher capacity batteries were capable of taking much more. We were putting about 140 to 150 amps into them and that much power created more resistance in our double-ought cables. The cables closest to the alternator started to overheat. We took it slow and watched them carefully. Soon the batteries were getting charged a bit and, therefore, demanded less amperage. With less demand, the wires gradually cooled. In the meantime we were fighting a strong negative current so we decided to pull into a quiet anchorage about 4 hours short of our goal. Once anchored, Lee and I set to work to do some re-wiring in an attempt to mitigate the problem with the overheating cables. We made a few changes that should help, but the problem won’t be fixed until we replace a couple cables with larger ones. While working on the wiring I was putting a lot of pressure on a wrench to loosen a bolt. My hand slipped and the wrench shorted out a battery. It only lasted a second but was enough to burn out a small wire which glowed and smoked as its insulating cover melted. Smoke on a boat is always frightening, but even Lynda remained calm only asking what we were up to. We cleaned up the mess and finished the wiring and checked all the circuits and everything was working fine. We had done as much as we could so put everything away. We were both hot and sweaty and Lynda insisted we take showers before enjoying a drink. Enough excitement for one day! Another boring day on the water . . . Well except when another sailing vessel came into Rock Hall and docked against the same bulkhead we were tied to. Mark and I caught lines and helped them get fenders out. They were on the way back from Florida. They stopped at Rock Hall to meet a broker to look at a trawler. When sailors can no longer sail they get a trawler and then a motor home, so they say. We were penned against the bulkhead by south winds coming straight into the harbor. The wind eventually abated from 20 mph to 10 or so and we (Mark) decided it was our best chance to go. We grabbed all our dock lines and Lynda and I pushed the bow away from the dock. Mark motored us away in great fashion. After an hour or so of motoring, Lynda, the beagle, said she smelled something like hot car breaks. Mark investigated and found that the new 4D batteries were able to accept charge much faster than the old group 31 batteries. This meant that we needed larger wires to carry the load. As the batteries accepted charge the charge rate slowed and the wires cooled and weren’t a problem for the rest of the day. We headed for Chesapeake City in the CD Canal but the current was against us so we decided to stop at a well protected anchorage at Still Creek. We pulled in and anchored in 19 feet of water in a most beautiful place. Being here is worth all the rest of the trip. After a celebratory beer, we undertook to remedy the wiring problem. Wiring on a boat that someone else has owned is always an adventure. To get to the batteries required completely undoing the master birth. While we were working on the wiring we accidentally crossed a hot terminal with a ground that caused massive smoke and melted the insulation from one of the wires. We still don’t know what the wire was for. We reinforced one of the wires and hope that will take care of the problem until a permanent fix can be accomplished at Woods Hole. We are in an absolutely beautiful anchorage. 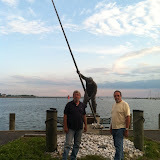 Tomorrow we will head on to Chesapeake City and Monday out for three days and two nights to Cape Cod. The adventure continues. “First thing after breakfast Lee and I hauled the six group 31 AGM batteries (maybe 65 pounds each) up through the hatch over our bed. The battery compartment is under the bed, so we used the main halyard on a winch to lift them one at a time. It was slow, hard work getting each battery onto the bulkhead we are docked at. We spent the rest of the morning waiting for the delivery of the new 4D AGM batteries—bigger and we hope better. A couple calls to urge a little more urgency (we had a noon appointment to look at the boat Lynda and Lee are interested in) and they were finally delivered. And the most amazing thing. The young delivery man picked up each battery, one at a time, and carried them down from the bulkhead we are docked against onto Windbird, then ducked under the dodger, stepped down into the cockpit, around the wheel, down the companionway steps, down the hall to the aft cabin, and then up and over the cabinetry and down into the space under our bed where the batteries will stay. He did all this without once setting them down. And they weigh 133 pounds each!!! We all just stood with mouths agape watching. And he wasn’t a hefty built young man. Ah, youth! Batteries in, Lee and I started the process of hooking them up. Then noon came and the yacht broker arrived so we quit to look at the boat. She was beautiful, but Lee and Lynda have made no decision on whether or not they are going to buy her. After that we had a quick lunch and went back to work wiring the batteries. We completed that job–no problem. Then we switched gears and worked on the very slowly draining sink in the galley. This has been a perennial problem so I wanted to see if we could really clear out the drain hoses this time. We had tried a bit yesterday and I poked the handle of the plunger right through the plunger bulb. So today I borrowed one from the little store next to the bulkhead where we are docked. And we plunged and we plunged. Finally only clear water came up (well, as clear as the water in this basin gets). We’ll have to see how long it lasts this time. Here on Cape Cod, we are having beautiful spring weather. I hung out with Ollie again today while Heather and Jed went to work. They both came home in the early afternoon and after school we all went to see the baby lambs at Peterson Farm. This is one of the oldest farms on Cape Cod and was purchased by the town of Falmouth in 1998 to keep the land from being developed. A local veterinarian keeps her sheep there along with a lone llama named Scamp and a few goats. The town wants the sheep there to keep the grass cut and it is a wonderful place to take children in the spring. 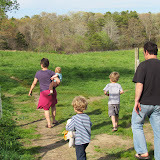 We walked through the fields surrounding the fenced pastures and enjoyed the magic of springtime in New England. Then we came home and had Florida grown corn-on-the-cob (delicious) and grilled pork chops. We ate on the deck and Sam set the table with the best linens and silverware. He was so cute wanting our first outdoor dinner of the season to be so fancy. Then we walked down the street to Smitty’s to have ice cream. It was a beautiful day. I just talked to Mark and he is really conflicted about what to do. The weather continues to give him fits. 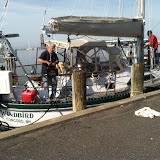 They will leave the Chesapeake tomorrow and spend tomorrow night in Chesapeake City in the Chesapeake-Delaware Canal. From there they could head on out into the Atlantic. But the winds are supposed to be from the NW, NNW, and sometimes N in the next few days. Mark would prefer to have S winds, but when they come later in the week, the winds will be stronger and the seas bigger. So the decision will be to go with light to moderate winds on the front quarter or much stronger winds on the aft. I wish him luck with his decision. It is never easy. “Today was a long, slow motor up the Chesapeake Bay. But there were some breaks in the boredom. About an hour after raising anchor at Solomon’s the high water alarm went off. I ran the electric bilge pump and then saw that the packing gland was leaking more water than usual. It should drip every few seconds just to cool the cutlass bearing. Ours was more than dripping so I got out my wrenches and tightened it up. End of problem. A little later we decided to put out a fishing line. After all, there were dozens of fishing boats all around us, so there must be fish. While getting the fishing line out I remembered that I needed to clean the water maker filter by dragging it behind the boat. So I did that. And the thought ran through my mind that maybe we could catch a big fish on the filter?!! Sometime later – no fish yet – I hauled in the filter, installed it, and started the water maker. Lee and I had rebuilt it about a month ago and I was anxious to try it out. It worked like a charm. It seemed like more output than we are used to, but after about forty minutes of running it was producing potable water. I filled two jugs to use later for battery water and to pickle the water maker membranes when we lay it up for a while. Still later we unfurled the Yankee to get a boost from the 12 knot winds. It helped a little, but we had to keep motor-sailing to make it in the Rock Hall before dark. Still, it felt good to run with a sail up for a while. I just talked to Mark and he fears that winds from N and W forecast for Monday and Tuesday, might delay the off-shore passage. They will continue watching the weather and make decisions accordingly. Back on Cape Cod, things are going well. Jed got home from his conference in Portugal late this afternoon and I just got a call from Heather saying the three-hour symposium on the Fukushima nuclear disaster that she was moderating this evening went great. Sam and Jonah both went to school today and Heather went to work, so Ollie and I spent the day together. His ear infection and cold are much better, but he’s still not a hundred per cent, so we kept him home instead of sending him to the day care. Sam is also much better, so the hope would be that we could enjoy a sick-free weekend. But just like the weather, that could change at any moment, so we’ll just have to wait and see.